Yes, you have come to the right blog! 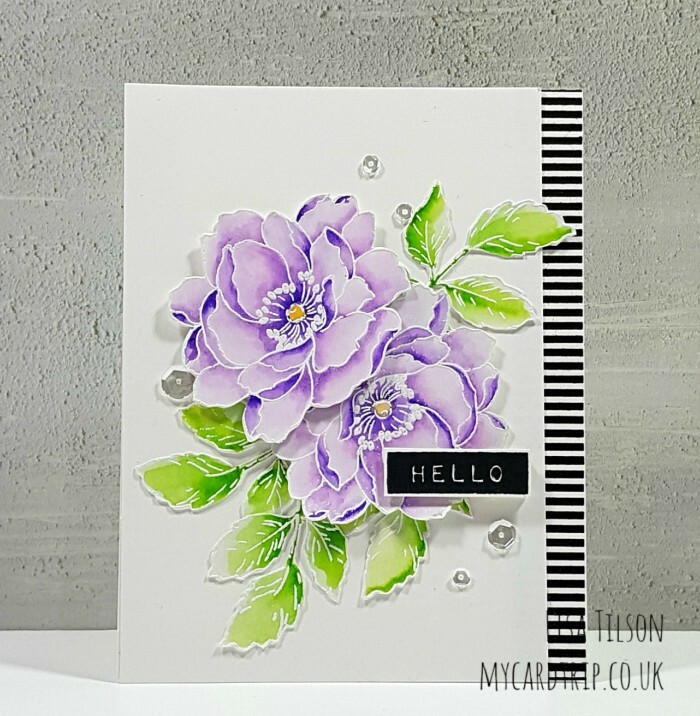 Today I have a floral card for you – it’s been a little while I know, but I finally had a few hours to spare. And boy did I need a few hours to play with this set as there was all sorts of to-ing and fro-ing. Nonetheless, here is the card for today. I apologise for the photos, it’s been grey and rainy for days and hard to get good light. 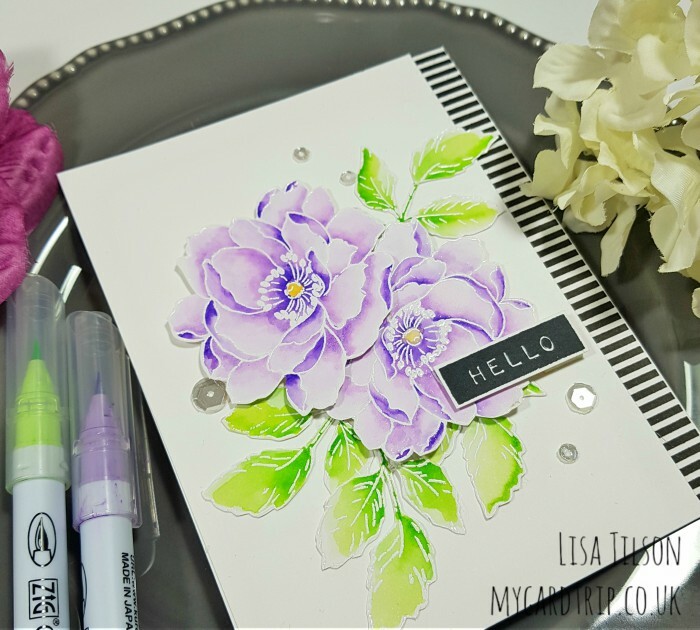 I started off by repeatedly stamping the floral image with Versamark ink over a panel of Winsor & Newton Bristol Board Extra Smooth Surface cardstock and then I added white embossing powder and heat set. I set about colouring the flowers with Zigs (lilac, violet and bright yellow), stamped some little green floral accents from the Altenew set into the gaps, and promptly disliked it. So, as I didn’t want to waste the hour of colouring time, I grabbed my scissors, cut all the flowers out and thought I would make a pretty arrangement with them instead! With that in mind, I then had to stamp and heat emboss four sets of leaves, colour them with Zigs (pale green and light green) and then fussy cut them too. I played around with the arrangement and then decided to stamp some black and white lines down the side of the base card for interest, and also to tie in the sentiment. To stamp the lines, I used a discontinued set from My Favorite Things called Washi Patterns – it’s so useful, I don’t know why they don’t make it anymore. I took an A2 panel of Neenah Solar White and trimmed a little off one side so that you would be able to see the black and white lines on the base card and I then adhered the floral arrangement down, using wet adhesive and foam tape depending on what was where. I stamped the greeting twice in the MISTI using Memento Tuxedo Black, cut it out and popped it onto the arrangement. Lastly I added a spattering of sequins. So that finishes my card. Into the box it goes, ready to be sent out at an appropriate time. With a bad back and then a bout of stomach flu, I am very behind on creating cards, and so I need to get some ready. Wishing you all a great week ahead, I will be back soon with another project. Wow, Lisa! This card is amazing!! I love everything about it and think it’s beyond stunning! I can’t imagine NOT liking every aspect of this!!! It’s truly gorgeous! Kudos to you (you have mastered the Zigs much better than I…)! 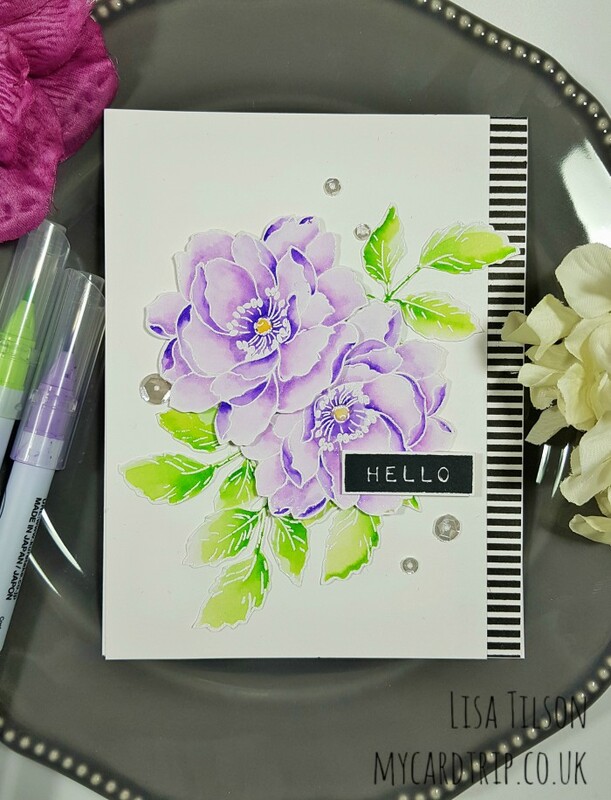 Lisa its a beautiful card and Im glad to know Im not the only one that does all that stamping and designing then changes my mind and ends up fussy cutting and re designing. But the best bit is it turned out brilliant and I love the watercolours you achieved on it, the lovely soft mauves and that wonderful green. It always amazes me too when a company stops producing a stamp that I feel is just a perfect stamp and I use often and see around the place but I suppose especially today in this mad race to produce so many stamps per month for release for every company they end up running out of room on their shelves and who knows it may get released again one day re invented. 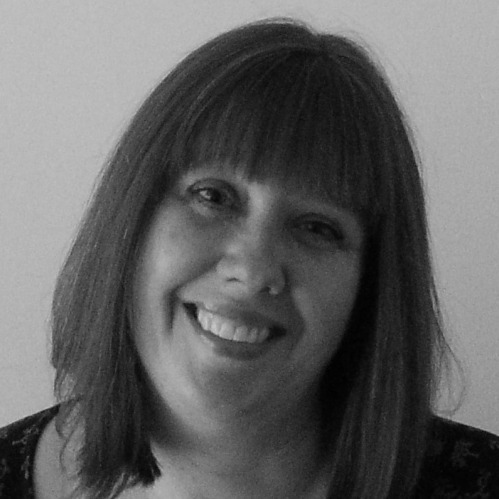 Sorry you haven’t been well, the weather hasn’t been so nice over your way and I think a few people have been knocked around whereas over here we are still having mad hot days and you would think it was still summer except the days are so short.